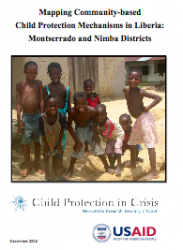 The goal of this research was to take a bottom-up approach in examining existing Community-Based Child Protection Mechanisms (CBCPMs) in Nimba and Montserrado counties in Liberia. By understanding how communities define, prevent, and respond to child protection violations and how local systems connect (or do not connect) to formal protection systems, these mechanisms may then be supported, improved, and expanded upon. This research utilized community mapping to explore local perceptions and experiences of child protection. Data were collected in five sites each in Montserrado and Nimba counties.